The company is beating all three tech giants as far as monthly device usage is concerned, according to the latest reports from eMarketer. 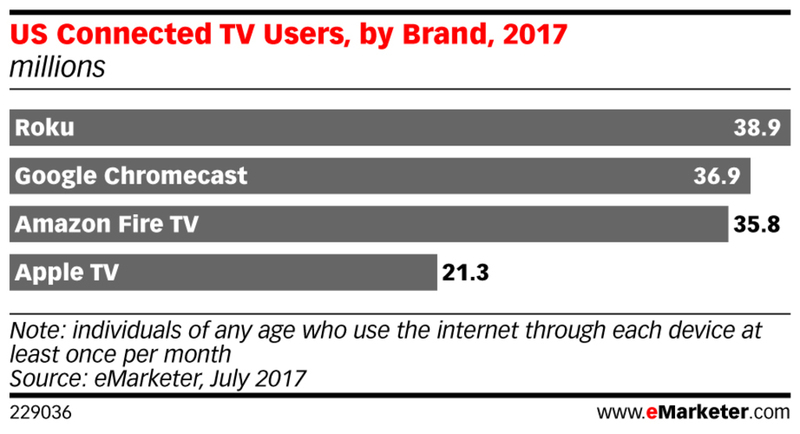 Roku can boast it has 38.9 million months users of its device in the U.S., putting it in first place. It’s followed by Google’s Chromecast with 36.9 million monthly users. Amazon’s Fire TV comes in third place with 35.8 million monthly users, and the Apple TV comes in fourth place with 21.3 million monthly users. The biggest loser this time around is actually Google, as its Chromecast device was the market leader last October. Roku has now surpassed it.